3-D Monster: Comic Strip From 7th Grade! 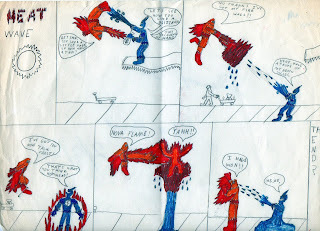 When I was in 7th grade, February 12, 1987 to be exact, I created this awesome comic strip featuring characters of my own design; "Heat Wave" and "Jack Frost". I can't believe I got a 75 for this! What the Hell?!? The dissapointment was too much, and alas, this was the first and last appearance of these beloved characters.